Restore Salty Lemon Water is a kind of mineral-rich drinking water very good for human health. Salty lemon water is not only a pharmaceutical ingredient but also a nutritious drink ingredient. Fresh lemon is treated and soaked in salt for some time to have brownish skin and moderate salinity. Producers process salted lemon by whisking it in water, added sugar to create a tasty drink. It is a curare to some common diseases such as bloat, abdominal gas swelling, sore throat, cough and weight loss. Likewise, bottled salty lemonade is also a product good to human health. According to Oriental Medicine, preserved lemon or lemon prickle is beneficial to human health and cures many common diseases. If you are feeling bloated or indigestion, you will need to take just a piece of lemon prickle or crush it in hot water to drink. Salted lemon works to enhance food metabolism, reduce abdominal distension, treat flatulence and dyspepsia very effectively. Using salted lemonade mixture to rinse the mouth three times a day will work to reduce the feeling of sore throat pain. The skin of preserved lemon has many essential oils, helping to clear throat and enhance antiseptic to reduce throat itching immediately. People with chronic intestinal disease can have their disease healed with salted lemon as it helps digestion and improves intestinal system. Holding a lemon pickle in mouth or steeping it with hot water to drink helps dissolve phlegm very quickly. Before going to bed, holding a slice of lemon pickle in mouth until it melts and slowly swallowing it before sleeping can cure flu and typhoid in just one night. Preserved lemon helps burn fat, eliminate excess fat on the body quite fast. Compared with conventional methods, which can only lose weight in certain body areas, warm salted lemon water reduces fat on all body parts (face, chin, neck, arms, legs, abdomen and buttocks) very effectively. Therefore, if you want to have a slim, lean body, you should drink salty lemon water daily. 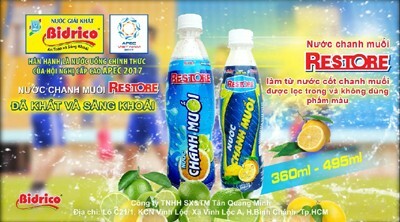 Restore salty lemon drink is a popularly trusted Vietnamese brand. If you cannot make preserved lemon for yourself, you can buy bottled salted lemon drink on the market. According to many consumers, Restore salty lemon drink made by Bidrico is safe to use, while the price is reasonable. The drink is bottled in 495-ml and 360-ml cans. This salted lemon solution contains potassium, pectin, carbohydrate, citric acid, D-limonene (fragrance of lemon essential oil) and other substances. Restore salty lemon drink of Tan Quang Minh Manufacture & Trading Co., Ltd - Bidrico Beverage is made from traditional methodologies using lime juice extracted from salted fresh lemon fermented naturally, extracted, filled and packaged automatically. All processing stages meet the strictest food safety and hygiene requirements and international quality management processes such as ISO 9001:2008 and HACCP (Hazard analysis and critical control points). Restore salty lemon drink is stored in 495-ml and 360-ml PET bottles and retains original flavours. The Bidrico drink undergoes strict control procedures from input to output to make sure that it is free from toxic colorants. It only uses natural lemon ingredients to ensure safety for users. Salted lemon contains such mineral salt components as Na+ and K+. Therefore, green-labelled Restore salty lemon drink is good for all consumers, helping them to refresh the health, supplement water and minerals depleted by hard labour or fitness exercises. Another assurance to consumers is Restore salty lemon drink is made by Bidrico, one of leading beverage brands in Vietnam. Bidrico is trusted by consumers and voted as Vietnamese high quality goods for decades. Bidrico products are imposed strict international quality, food safety and hygiene standards such as ISO 9001:2008, HACCP; and export standards like the US FDA, FCE & SID. They also won International Quality Summit Award in the Diamond Category in New York, the US in 2014. After 22 years of construction and development, Bidrico is proud to be a market-leading supplier of beverages of natural origin that are healthy and of international standard and changing consumption trends of Vietnamese people towards natural originality. Currently, Bidrico owns many quality beverage products on the market, which are popular among consumers, such as carbonated drinks, bird nest drink with white fungus, A*nuta green teak, Bidrico energy drink, Restore salty lemon drink, Yobi yogurt, A*nuta fruit juice, fruit jelly Bidrico canned and bottled drinks, Bi’s bird nest drink and many others. All products are characteristic, convenient and diverse in categories and flavours to meet various consumer demands and tastes. They are of high quality, safe to use and good for health as Bidrico takes customer satisfaction as the ultimate business goal and takes customer satisfaction as the gauge of success.